If there is enough snow, you dont have to make it all the way to the top of Dachstein West glacier. The area is full of skiing slopes and the last day we stayed in Russbach on the slope. The wole area is very much family friendly, with lots of Family hotels, some of them have indoor Playground and offer Babysiting. I had my eye on a hotel: Sommerhoff, that had 4 Indoor Play areas and finds its self right next to skiing slope for Kids. It is a very nice hotel and offeres full luxury. The price equals, unfortunatelly. Gosau and Russbach are close to Bad-Ischl - magic town where Kaiserin Sissi got engaged to Karl Franz Josef. The whole of town is a reminder of those times, souvenirs, museum, portraits of both royalties, it is truly enchanting. Here they also have Spa-swimming pool that we didn’t have a time visit, but I was very much tempted. If you go to this area - I truly recommend to make time and have a dip in thermal waters of Bad-Ischl. Our diesel car froze, when we were leaving and I will skip the rest of the afternoon when we had to be toed to the closest car work-shop and spent pretty much the whole Sunday afternoon there. Moral of this story - buy your diesel in Austria, possibly in the mountain area where they sell quality fuel that will not freeze up to -30C. So far - Dachstein west was our best experience with Kids. On the top of the Glacier, there are plenty of restaurants and mainly, they have seat lifts in majority. For example - when we visited Hintertux with Kids, majority of Lifts on the top were bar Lifts - so the Kids (and you) don’t have a chance to rest their legs in between skiing runs and they run out of energy very fast. Something for parents: we have leaned about local speciality called: Heisse witve (Hot widowe… :-) it is a plum liqueur, that they warm up with whipped cream they you drink through tiny straw. It is very yummy and since our trip it became or ritual to have it after the whole day of skiing. You actually dont need anything. The whole area is packed wit Ski rentals, ski equipment shops and pretty much anything you might need. 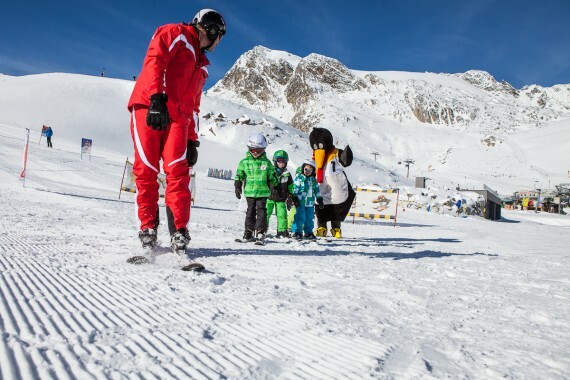 You can also book your Kids to Ski-schule but make sure you do it in advance. All the instructors speak English and also, there are many Kid Worlds on the Top of he hill with special programmes. Mayrhofen is very famous skiing resort for world championships. Is it about 30 km away from the Hintertux Glacier and has many slopes around. To make sure we get a snow, we stayed in a hotel in the village called Tux - 12 km away from the Glacier main cabin lift. To get to Tux and Zillertal you have to drive through Mayrhoffen. You can also book a hotel in Tux - Zillertal area, where is the big Indoor Playground with Babystting. Zillertal has many slopes around as well and you dont have to go all the way to the Hintertux Glacier. Hotels in this are are more expensive then in Dachstain west and they are harder to get. You have to book in advance. Wat we didn’t like was getting to the top of the glacier. It took us 2 swaps of cabin lifts and it took around 40min just to get to the top. Here they had just one cabin lift running, the rest of the lifts were bar-lifts that do not let you have a rest. Possibly, there is more seat-lifts but that all depends on the snow. The more snow the more slopes they open. Here in Tux - Zillertal - here is a huge Indoor Playground with babysitting and that is a great perk for families. 14 hotels from this area built this Indoor Playground together and they sponsor the babysitting and a Minibus, that collects the Kids form the hotels and takes them here - FOR FREE. You order the pick up in your hotel and your Kid can be collected. Perfect for families with smaller Kids, who cannot ski all the time just yet. You can also order a lunch for your Kid there for a very good price 5-6 EUR. Its like a fun day care. Here is the list of the partner hotels that offer this FREE service. If you stay in some other hotel, you will have to pay for the PlayArena. We will return to Dachstein West in few days and I cannot wait for the Austrian hospitality, great food and fresh air. All these areas can be checked on-line for weather conditions including web cams. If there is enough snow, you cannot go wrong with any hotel there. Majority of them have a spa and small play areas for Kids. If the snow is just on the top of the glacier, you might make sure to be as close to the main cabin lift as you can. There are also buses that collect you from your hotel and take you to the lifts. Your hotel will also assist you with booking a Kids-schule.